December PONY Mag is here! 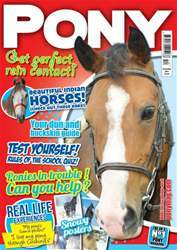 Test yourself with our Rules of the School quiz, learn how to deal with a pony in trouble and perfect your riding with our Amazing Rein Guide! Plus, WIN loads of great prizes, including a set of Mini-Jumps with your very own design, tickets to Olympia, The London International Horse Show and much more!